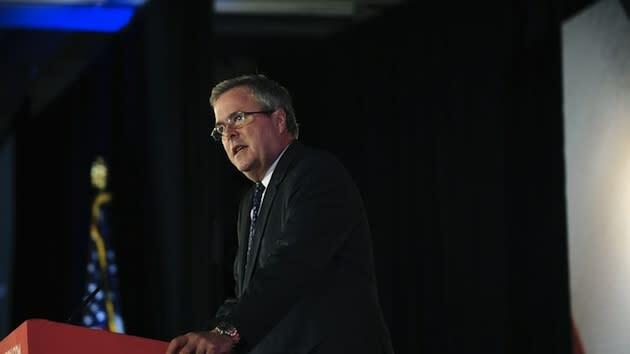 Jeb Bush, a former governor of Florida, had a lot to say at Friday's Faith and Freedom Coalition conference. But the thing that has everyone talking: his description of immigrants as "more fertile" than native-born Americans. Bush, a recurring potential candidate for president, is fluent in Spanish, married a Mexican-born woman and has a strong contingent of Hispanic support in Florida. When he said at the annual meeting in Washington, D.C., that immigrants are "more fertile," and so can replenish the country's population with young people, he likely misspoke, although it's true that immigrant women have a higher fertility rate than women born in the U.S. The line overrode his other remarks—even one suggesting that the United States model itself after Canada on immigration. Noting that immigrants create more businesses than do individuals born in the United States, he said, "Canada is the place that we might want to look to"—referring to a country often attacked by conservatives as an example of a socialist state. "They have more economic immigrants, and they have seen sustained economic growth because of it." Bush in general championed reform ideas not held by most of the conservatives who shared the stage. And unlike the speaker who preceded him—tea party conservative Michele Bachmann—Bush offered full support for immigration reform. Perhaps not surprisingly, he was greeted with tepid and sometimes absent applause from the mostly evangelical Republican audience at the J.W. Marriott hotel. "The one way we can build the demographic pyramid is to fix a broken immigration system to allow more people to come to learn English, to play by our rules, to embrace our values and to pursue their dreams in our country with a vengeance to create more opportunities for all of us," Bush said. "This is a conservative idea. And if we do this, we will rebuild our country in a way that will allow us to grow. If we don’t do it … we will be in decline." Bush drew the most applause during his speech for unrelated comments on the value of education. Bush's speech was in sharp contrast to Bachmann's remarks. The congresswoman stridently argued against the bipartisan immigration effort working its way through Congress and warned of what she described as a dangerous fast-tracking of the bill, noting the July 4 target date for Senate passage and August target date for the president's signature. "That's a breathtaking speed to get a bill of this magnitude through the United States Congress. Why is it of such great magnitude? Because we are looking at the legalization of over 30 million illegal aliens," Bachmann said. The bill, yet to be hashed out by the full Senate, includes a pathway to citizenship for the 11 million unauthorized immigrations living in the U.S.
Bachmann also argued that the system to check for legalization status would be destroyed under the bill and that blacks and Hispanic-Americans would suffer the most if the bill passed because of increased job competition. "This is not an anti-immigrant speech," she said. Republican former Rep. Allen West, who spoke after Bush and Bachmann, also railed against the immigration reform bill, saying it would further "exacerbate problems" in the beleaguered black society of America. One additional speaker advocated for immigration reform on Friday: the evangelical Rev. Sam Rodriguez, president of the National Hispanic Christian Leadership Conference. He warned the audience not to "drink the Kool-Aid" about the current immigration bill and pressed for more conservative outreach to Hispanics. In an interview with Yahoo News after his speech, Rodriguez offered support for Bush, saying "Jeb Bush gets it." And he used Bachmann as an example of the wrong path forward on immigration for the Republican Party. "If her argument wins this day, she will be responsible along with [former Colorado Rep.] Tom Tancredo, [Wisconsin Rep.] James Sensenbrenner—those names will go down in history as the reason why Hispanics voted Democrat, not the other way around, for the next 57 years," Rodriguez said. Rodriguez said Bachmann's speech on Friday did serve to highlight conservative concerns including what Rodriguez believes is a "great mischaracterization" of facts related to the legislation, including that the border will be more porous.